When you need a hooded jacket that works like a pro, check out this Wrangler Riggs Men’s 3W182 LD Loden Hooded Ranger Jacket, one of the hardest working men's jackets on the job site. With HeatSeeker™ technology for plenty of insulation, water-resistant fabric, ... (see full details) (see specifications) #3W182LD. When you need a hooded jacket that works like a pro, check out this Wrangler Riggs Men’s 3W182 LD Loden Hooded Ranger Jacket, one of the hardest working men's jackets on the job site. With HeatSeeker™ technology for plenty of insulation, water-resistant fabric, and all the toughness and mobility you need in a work jacket, this Ranger jacket is everything your workday requires and more. Comfortable and rugged, this Riggs men's jacket is lined with a quilted 100-gram polyfiber insulation that uses HeatSeeker™ technology to trap your body heat efficiently. This means you'll have natural warmth all day around your core - because shivering certainly won’t help get the job done. The full front zipper is tough and rugged, and this Wrangler Loden (dark green) jacket features multiple pockets for your convenience: two flap chest pockets, a zippered hidden pocket at the left chest pocket, oversized lower front pockets with snap closures, a cell phone pocket and a pencil pocket on the left sleeve, plus secure inner pockets. With both large and small pockets, you can carry just about anything you need and have it easily accessible while you're on the job - from nails, screws, nuts, and bolts, to business cards, to small tools - you'll have a place for it all. The attached three-piece hood is designed to fit your head without extra bulk and can easily be adjusted with the drawcord when you really want to seal out the worst of the weather. 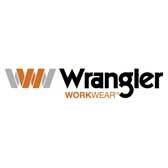 All of the main seams have triple stitching for even more durability because Wrangler knows you work hard, and they want to offer you men's outdoor workwear that keeps up. Designed to fit a working person, this men's work jacket has an action back to make moving and working even easier. You won't have to worry about your clothing binding or pinching you no matter what you're up to, thanks to the added mobility of the action back that delivers ease of movement without extra bulk. Built to help keep you warmer and drier, this Riggs Ranger jacket is made with water-repellent fabric, an 8-ounce blend of 55% cotton and 45% polyester. In addition, the Ripstop fabric helps keep small rips and tears from spreading, adding durability. The straight-bottom hem allows you to easily layer as the weather requires. The inner rib knit storm cuffs on the sleeves are hidden beneath the design hem so you don't see them from the outside, yet they're working hard on the inside to keep debris out of your sleeves and to trap and hold your body heat inside. Even better, this professional hooded outerwear is machine washable which makes it easy to keep clean and looking good. Work hard and stay comfortable (and dry!) with this Wrangler Riggs Men’s 3W182 LD Loden Hooded Ranger Jacket from Working Person's Store. Order today! Wrangler Jackets: Riggs Men's 3W182 LD Loden Green Hooded Ranger Jacket is being added to your cart.